Are you fulfilling the hopes and dreams your younger self had for you? What would you still like to do before you die? As a teenager I dreamed about traveling the world as a flight attendant, meeting interesting people, doing business and having fun. We all start out bright-eyed and bushy-tailed with big, big dreams. Anything seems possible and we believe in the magic of life. Then society’s prescribed recipe for life kicks in – study, work, mortgage, marriage and having kids. When you blink, you wake up in your 40’s or 50’s and wonder how you ended up here and if there’s still time to live the life you’ve always imagined. And I most certainly had some fun along the way. However, there are still so many things I would like to do. Over time I’ve compiled a list of 101 goals that I would like to achieve in my lifetime, an exercise I learned from Jack Canfield, famous co-author of the Chicken Soup for the Soul book series, and I revisit my list often to ensure it stays front of mind. My 101 Goal List includes goals from all areas of life – personal, professional, emotional, wealth, health, social, contribution and spiritual. The aim of the list is to dream the seemingly “impossible” dream. For the most part, I have no idea how I’ll achieve all my dreams but I believe that if you have the desire to do something, you also have everything you need to achieve it. My goals + dreams are based on what matters most to me and range from mastering my mind + emotions, living a happy + harmonious life and having a fulfilled relationship, to a few more challenging ones. Speak in a stadium of 50,000+ people. It doesn’t matter if your dreams look different to mine. All that matters is that it’s something YOU want and it’s meaningful to YOU. your 20-year old self had for you. Write them down as you go and start your own 101 Goal List today. What dreams did you have for yourself? Have you realized any of them? Is it still something you would like to do? What new dreams would you like to add to your list? I thought I’ll quickly share the story behind the Before I die… walls with you, as I love the concept. 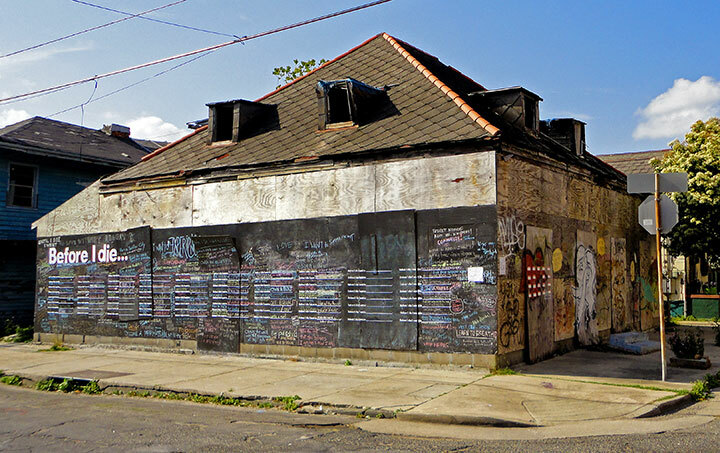 After losing someone she loved and experiencing deep depression, artist Candy Chang created an interactive wall on an abandoned house in her New Orleans neighborhood. 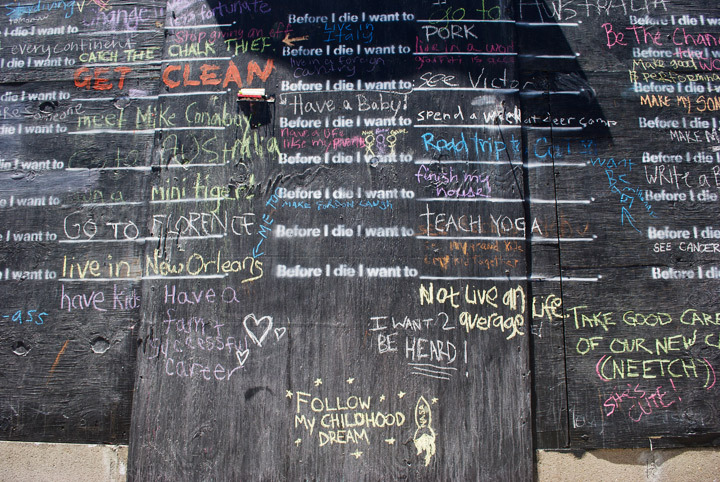 She created the wall with chalkboard paint and stenciled it with a grid saying, “Before I die I want to _______.” Anyone walking by could pick up a piece of chalk, reflect on their lives, and share their personal aspirations in public space. After posting a few photos online, the images spread and she received hundreds of messages from people who wanted to make a wall with their community. 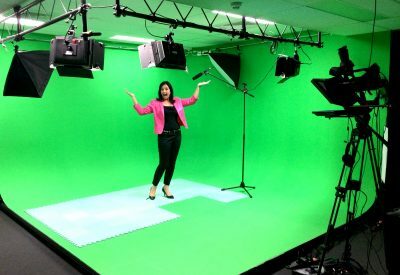 She created a website with resources and now over 1,000 Before I Die walls have been created in over 35 languages and over 70 countries. 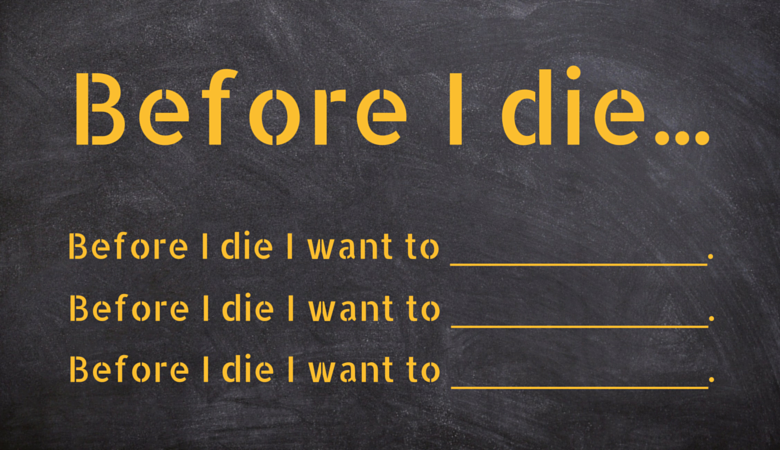 What is one of the things you would like to do before you die? Leave your comment below. 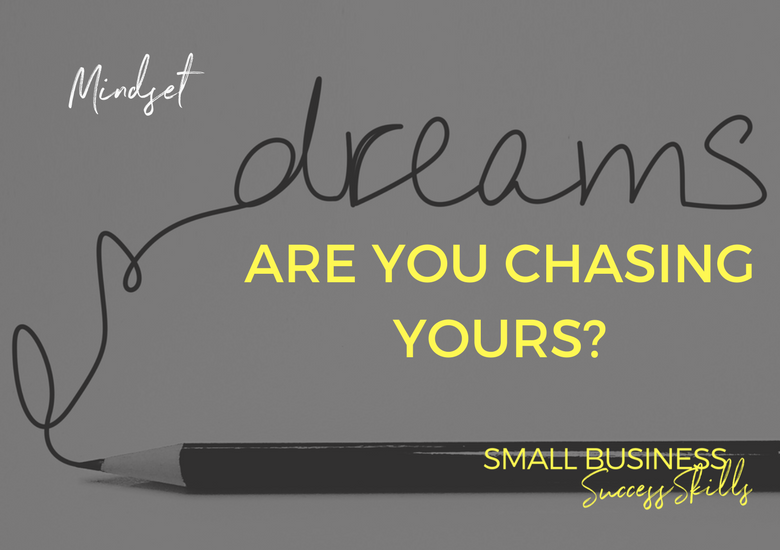 Are you wishing for things to happen or are you actively chasing your dreams? As a young girl growing up in a small town in South Africa I had many dreams. I fantasised about travelling the world, meeting interesting people and having fun. To date I have lived on three continents and traveled to 65 cities and counting. It hasn’t always been rainbows and unicorns… far from it. When I first moved to the UK in 1997 my parents were dead set against it and they didn’t support my decision emotionally or financially. In fact, my dad didn’t speak to me for the last month before I left! 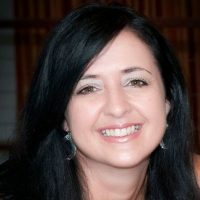 My husband and I moved to Australia in 2009. We had to move house five times in three years, and I lost my job and 457-work visa within six months of moving here due to the global financial crisis. We nearly had to leave the country before our permanent residency came through. When we try something new and get out of our comfort zone, we win and we lose. I have lost special places, friendships, possessions and identities but I also gained new perspectives, friends and experiences. Are you waiting for the right time? Are you waiting until you feel ready, until you’re settled in, until the kids go to school or until they leave home? There isn’t a perfect time to follow your dreams, there is only now. And all great adventures start with a decision to make it so. Whatever your dream is — whether you’re halfway there or haven’t even started — you need passion, perseverance, self-belief and a plan to make your dreams a reality. Make time to sit down in a quiet spot and get clear about who you would like to be in your life and what you would like to have and do in your life. Get clear on what matters most to you (your values) and define what success looks like for you. e.g. I was very clear about my dream to travel the world and freedom is important to me, so I set my life up to be as commitment-free as possible and I use all available money to travel often. It’s different for every person and there’s no right or wrong answer, only what will make you happy and lead a fulfilled life. Write your dreams down in a journal or diary and refer back to it at least weekly. This ritual keeps your dreams top of mind and helps you commit to make it happen. You only need a few people who understand you and what you’re trying to achieve. This could be your family and friends or not. e.g. I thought my family would be excited for me and support me, but they didn’t and still don’t in most of my endeavors. So I don’t speak to them about my dreams, I speak to my husband and a handful of close friends and advisers who support me. You’re looking for people who can encourage you, uplift you, be honest with you and who live their own out-of-the-box version of life. Make a list of 3-5 people – family, friends, mentors or peers – who will support you in chasing your dreams and keep you accountable to do what you say you’re going to do. Writing down your dreams is a great start but nothing gets accomplished without a plan. What are the steps you need to take to make your dreams a reality? Work backwards from the end result and write down everything that needs to be done. Initially you can feel overwhelmed when looking at the list and that’s why we need to chunk it down in main sections before setting daily and weekly goals. Planning: where would you like to go, how long for, do you need visas, how will you get there, do you have enough money, what happens to the place you’re currently living in, what happens to pets? Accommodation: where will you stay, if long term do you need to speak to real estate agents before you leave, what’s included in packages? Packing: what will you take along, will you pack light and buy as you go, take unaccompanied luggage or ship belongings over? Work: do you need to work while you’re away, what do you need to do your job, do you need to find a new job, do you have the right to work abroad. There’s so much more I could add but you get the picture. There are a lot of things to do in each bucket, so now it’s time to chunk it down and schedule smaller monthly, weekly and daily goals in your diary with milestones. Remember what gets scheduled in your diary, gets done. Become aware of what might hold you back and what might stand between you and your dreams. Obstacles can include your mindset or everyday practicalities. List them out and come up with a plan to overcome each obstacle. It’s never the perfect time to start a business, have kids, write a book or move cities or countries. It’s easy to use one challenge or obstacle as an excuse when we’re scared. Fear tends to be the #1 reason why we don’t take action towards our dreams – fear of the unknown, fear of failure, fear of rejection, fear of looking ridiculous and even the fear to be yourself! Nothing happens until YOU take the first step – the Fedex guy won’t deliver your dream at the front door… unfortunately! Someone somewhere in the world has done something similar to what you want to do. Connect with people and tell them about your dream and ask them how they overcame their obstacles. People know people and when you talk about your dream you might just find people who can help you with the next piece of the puzzle – advice, resources, money or whatever else you need to make your dream a reality. e.g. I spoke to people who lived in Australia to get first hand knowledge of what it’s like and I asked for recommendations from where to stay, which doctor and dentist to use to where to do food shopping and which brands to use. And it was a good friend from a previous workplace who organised an interview for me in Perth, that resulted in my initial work visa being organised. This is by far the best way to shorten your learning curve and not reinvent the wheel. If you can find a mentor or invest in a coach grab the opportunity with both hands – it will save you money, time, energy and lots of frustration. Be careful what you water your dreams with. Water them with worry and fear and you will produce weeds that choke the life from your dream. Water them with optimism and solutions and you will cultivate success. Always be on the lookout for ways to nurture your dream. Which dream are you chasing at the moment? Leave your comment below. Fears… when was the last time you leaned into yours? Sitting on the black leather couch, I looked at the elevator and thought about running. 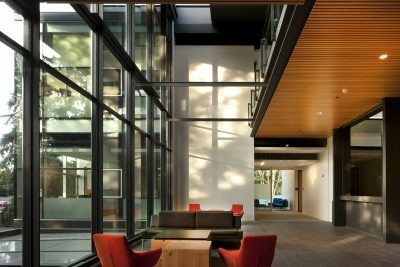 I was quite intimidated by the floor-to-ceiling windows and the hallway of awards. It’s 1999 and I wanted to partner with one of the world’s largest recruitment agencies in London as their international business partner. I stayed. I survived and they wanted to see a business plan. Theoretically, I knew what a business plan was but I had never created one outside of a class assignment. I pushed through my fears and inexperience and… I got the contract! In January 2000, I opened an agency in South Africa to recruit teachers for the UK. 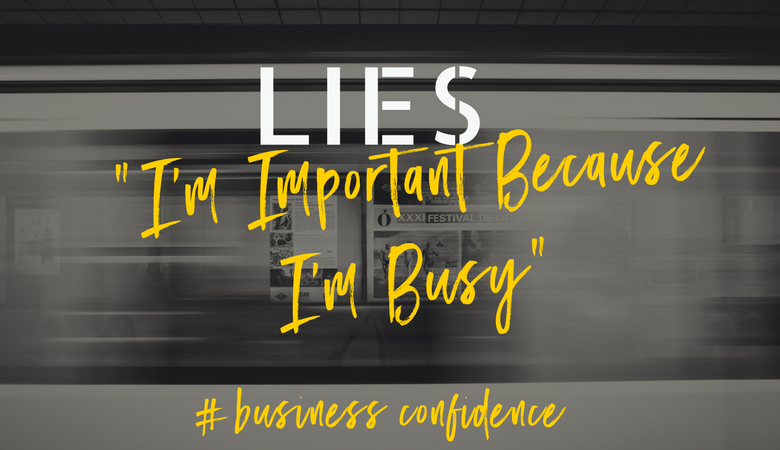 At the time, I didn’t even know how to send an email let alone run a business, but I believed I could and so I figured it out as I went along. It turned out to be one of the most amazing opportunities of my life. Now, I’m a seasoned entrepreneur in yet another country and another business venture. I see so many people holding themselves back from amazing opportunities, success, love and even life because they believe more in their fears, limiting beliefs, excuses and negative self-talk than in themselves and their abilities. Whoever you are and whatever you’re up against, lean into your fears and say YES to the next opportunity that lights you up, even if you can’t send an email! The best opportunities in the world can come along, but if you’re not sure what you really want it won’t matter. I was looking for something exciting to do when I returned to South Africa after my UK working holiday visa expired. My friend came home one day and said he was approached with the opportunity to become an international business partner for his teaching agency in South Africa but he wasn’t interested, as he wanted to stay in the UK. I immediately saw an opportunity for myself in this and approached my own agency with the idea (something they hadn’t considered at the time). I researched the opportunity before going in for the first discussion and it turned out top be a win-win for both of us. 1. Get crystal clear about what you want in your life and business – what does success look like for you? What do you dream about? 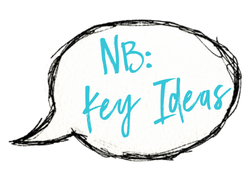 A muddled approach will give you mediocre results. 2. Do your homework when an opportunity or project comes your way to ensure it’s right for you and aligned with your values and goals. 3. Remember, if you don’t have plans of your own you’ll become part of someone else’s plan, so be ready when opportunity knocks. The next time a project or opportunity comes along and your inner critic pipes up pointing out how you’re ‘not good enough’ or ‘don’t know enough’ silence it, check in with your plans to see if it’s right for you and say Yes as soon as possible. Once you give your monkey-mind half a gap, fear will kick in and it will give you all the reasons why it’s bad idea, how you’re not ready for this and point out what else you need before you can say Yes. Instead of giving in to your fears, take the first step to make the opportunity a reality e.g. pick up the phone and make the call, reach out to the right people who can help you move forward or take a pen and paper and jot down your thoughts to get the ball rolling. How will this [opportunity/ project] help me to reach my goals? Remember, what is big and scary for you, will be easy for someone else and vice versa. If it’s right for you, say Yes and take the first step. It’s time to ‘become’ the person you’ll need to be to reach the goal so start by acting ‘as if’ you’re already that person. In my case, I had to ‘become’ the successful business person that launches the venture successfully. I had to ask myself how Catherine, my mentor at the time, would do this or negotiate that? Who do I know that speaks well in front of crowds? What makes them a good speaker – are they confident, funny, relaxed, knowledgeable? How can you copy those traits but still use your own personal style? What can you do/ say/ wear to achieve that trait? Who can I ask for help to better prepare myself for the situation? What are my specific fears around this and how can i overcome them? 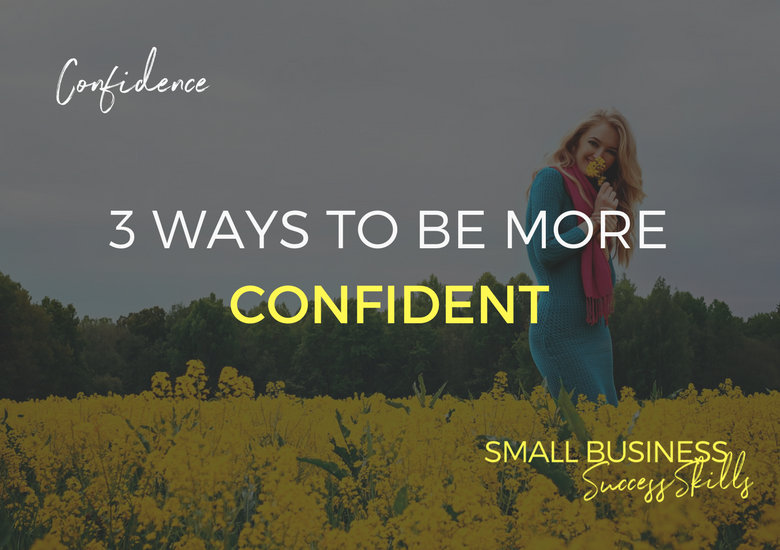 If you want to be more confident, start noticing confident people’s posture and body language, how they talk and what they wear. See how you can incorporate some of the same things in your own life and practice it daily to make it second nature. 1. Spend 5 minutes a day imagining being the person you want to become – how do you talk, stand and dress? What do you do in a day? 2. 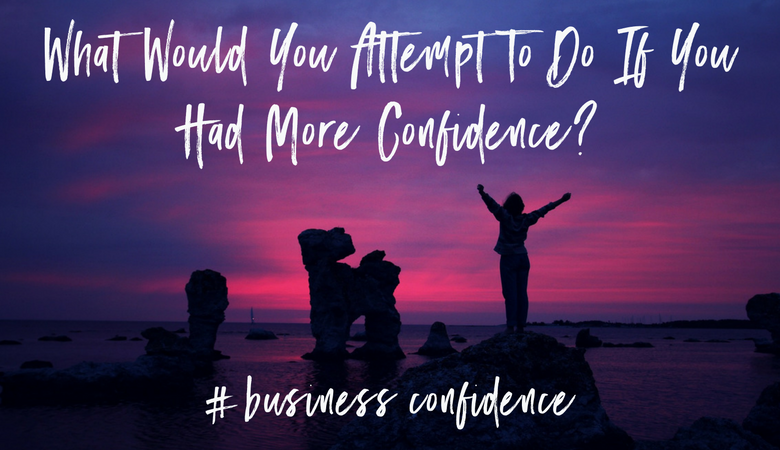 If we take the business networking event, see your more confident self successfully speaking in front of the crowd, their smiling faces and how proud you feel of yourself for pushing forward. See how excited they are about your offer and how you solve their problems. The more often you start acting ‘as if’ you’re already the person you dream of becoming, the easier it will be to say Yes to new opportunities and make your ideals, real. What opportunities have you won in the past because you said Yes, although you were scared? Leave your comment below.